My favourite time of the year. I've got the bonfire made, and have a load of fireworks that were imported under old regulations, so they're really big, and I've just made a guy, with a Mitt Romney mask. What Does Guy Fawkes Say? I had mine last night, it's raining tonight. Interesting article on BBC website. Fireworks night is still marked in the UK, but Ben Milne asks, where have all the guys gone? "Penny for the guy?" If you're feeling indulgent, it conjures up black-and-white images of cheeky urchins wheeling around a figure made out of tights stuffed with newspapers (and a turnip for a head), cheerfully cadging pre-decimal coins from indulgent adults on a chilly night. For the less charitable, it's a nasty outdated sectarian tradition, where youngsters beg with menaces, before a big bonfire is lit. But making guys seems to have been routed not by champions of understanding and tolerance, but because kids have generally used all their creative energies a week earlier on their Halloween costumes. Guy Fawkes night is still celebrated by a significant number of people in the UK, and firework sales have remained buoyant in recent years. But leaving aside notable exceptions like the town of Lewes, how many of these well-organised and health-and-safety aware displays still burn guys? The decline of the guy is not necessarily down to changing religious attitudes. The occasion is undoubtedly anti-Catholic in origin (a 1677 celebration is said to have burned an effigy of the pope with live cats inside "who squalled most hideously as soon as they felt the fire"). But Roman Catholic opposition to the event has never been very vocal - it's not unusual to find fireworks displays run by RC schools or churches. In fact, fireworks night is for most people just another excuse for a party, and most of the event's political connotations have been sloughed off. In this context, burning an effigy on a fire seems a bit, well, surplus to requirements. In any case, it's Guy Fawkes who has had the last laugh. 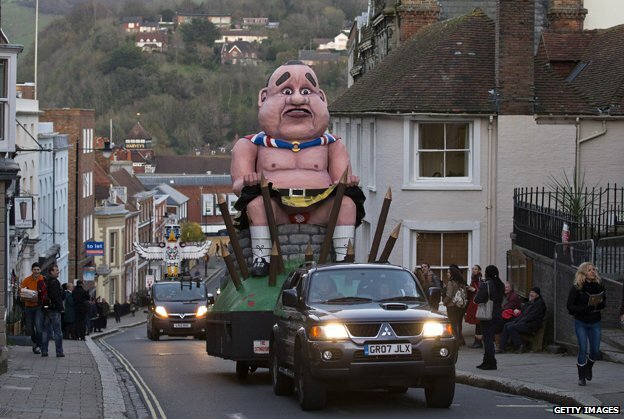 Having survived centuries on the bonfire, the parliamentary plotter now has another identity. Courtesy of the famous goatee'd mask from the film V For Vendetta, Fawkes lives on as an international symbol of political mischief-making and subversion, recognised by millions who have never heard the refrain, "Remember, remember, the fifth of November..."
[...]It was actually law to ‘remember’ this day for around 250 years with an act of Parliament passed to make it a day of thanksgiving for the “joyful deliverance of James I” from these evil Catholic plotters. But modern celebrations of Bonfire night, with their dazzling displays of fireworks, crunchy toffee apples and sparklers sanitize the gruesome reality of this tale. The man we remember, Guy Fawkes, was actually just the hired muscle. Robert Catesby was leader of this revolutionary band and thought to be far better looking and charismatic than poor tortured Guido (who, to be fair, had his own favourable qualities-loyalty being one). 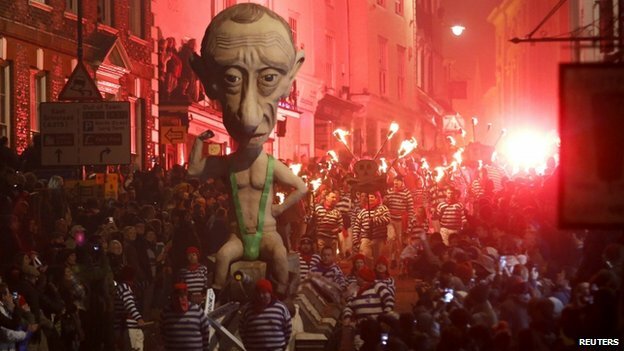 At Lewes' celebration last night Vladimir Putin and Alex Salmond went up in smoke.